It all began with YOU, end users! 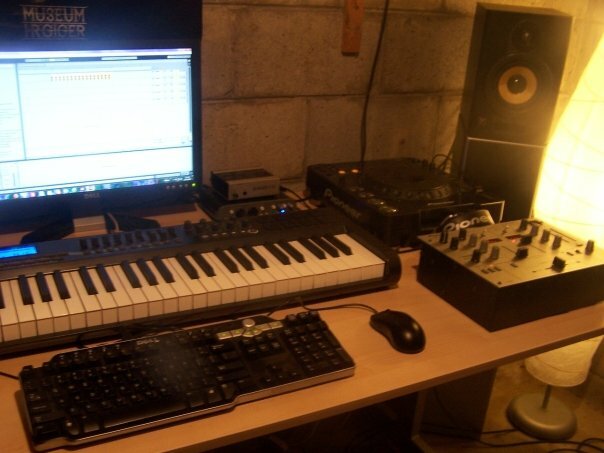 A typical home studio environment. 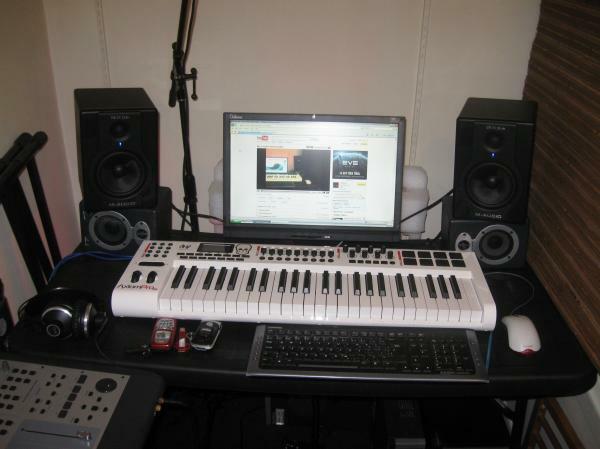 Notice the Fast Track Pro behind the keyboard with the hard-to-reach knobs. Pictures like this made us think about a “desktop-friendly” form factor. I’ll talk about this in detail in the next blog entry. Our customers weren’t shy about their opinions and didn’t hold anything back. We’re really grateful for this since the results of this research proved to be absolutely critical to the design of the C-Series products. Features like the built-in Monitor Management and the innovative “Multi” button and transport controls stemmed directly from our customer research. Even the basic shape of the product (i.e., having all the controls on top rather than cramming them on the front panel) was determined by what we learned from our user visits and from customer submitted photos. In short, the C-Series interfaces were completely driven by feedback we got from end users just like you. Notice the multiple sets of speakers. Seeing setups like this made us think about building an easy-to-use Monitor Management system into the C-Series products. I’ll discuss this in detail in a future blog entry. When we wrapped up the research and began building, there was a huge sense of excitement in the air! We knew that our C-Series wasn’t going to be another “me too” line of products in an already-crowded marketplace. Armed with all this customer research, we knew we were going to build a product line that was unlike anything in the marketplace and had all the critical features that today’s home studio users would need to create amazing work. 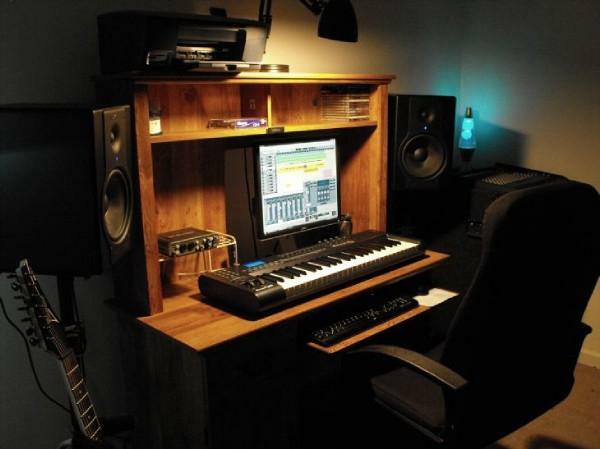 Another typical home studio environment. Throughout our research, we didn’t see a single Fast Track Pro mounted in a rack—they were always placed on a desk. In the next blog post, I’d like to tell you about the industrial design (I.D.) work that went into these new interfaces. Just about everyone agrees that these are very good looking products, but there’s a lot more to it than that! Please check back soon for more. Also, if you haven’t already done so, please check out the new Fast Track C-series overview video below and C-Series product pages to learn more about these products. PS: Continue on to Part 3 of this series. As a Senior Product Manager at Avid, I’m responsible for designing and managing M-Audio branded interfaces including the Fast Track and ProFire lines. I’m a composer at heart and I’m proud to say that I began my career many years ago at the very bottom: as an runner at various studios around Southern California! Later on, I was later hired as a Technical Writer (I’ve written documentation for Alesis, Numark, Akai, M-Audio and Avid) before finally becoming a product manager.